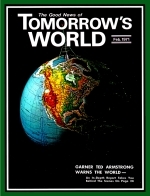 SOME OF our readers of TOMORROW'S WORLD are unemployed right now. Others may be in danger of losing their jobs. Not since the closing of the Great Depression have so many been without jobs. Yet as a recent article in The PLAIN TRUTH pointed out, in 1969 there was an average of three million hirings every month in the United States. Although in 1970 that rate dropped somewhat, estimates indicate businessmen and employers are even now hiring many thousands every month. Someone must replace those who retire, quit, die or are fired. Of course, new jobs constantly open as businesses expand, communities grow, buildings are built, and people buy more goods. Who will obtain these jobs depends on certain basic, unseen laws. There are certain economic laws that regulate economic conditions. I remember vividly the sudden, nose-dive depression of 1920. I was then a publisher's representative in Chicago, Ill. I was a member of the Chicago Association of Commerce, through its Advertising Club division. In early January that year, at the regular, midweek Association of Commerce luncheon in the Cameo Room of the Morrison Hotel, the noted business analyst Roger Babson was the speaker. He warned the businessmen of Chicago that within less than a year we were going to crash into the most drastic economic depression our generation had seen. I noticed some important bankers and security brokers smile knowingly in disagreement. They were sure Mr. Babson was wrong. A year later Mr. Babson was again the speaker at the same association luncheon. "I saw some of you businessmen smile, a year ago, when I warned you of the coming economic tragedy," he said. "Now let me tell you WHY I knew what was coming, and you didn't. "When you want to know what is the temperature in the room, now, you look at the thermometer on the wall. But if you want to know what the temperature will be, an hour or two from now, the thermometer can't tell you. You go down to the boiler room, or consult the U.S. weather prophet. "You look to the factors that determine conditions, not the thermometer that records conditions after they have occurred. You gentlemen looked at charts of current business activity, at bank clearings, records of freight car loadings, the stock market quotations — the thermometers on the wall. "But," he continued, "there are LAWS that govern economic conditions. These laws are the factors which determine what conditions will be, a few months or a year from now. They are the CAUSES." Yes, and your own personal economic future is determined by definite LAWS! Very few realize that the eternal Creator set in motion invisible yet inexorable LAWS, which regulate personal financial conditions! In my forty years in God's ministry, I have seen these laws actually work in the experiences of many people whom I have known personally. I have experienced their relentless working in my own life! I had to learn this lesson the hard way, myself! I have often mentioned on the air, and in articles in The PLAIN TRUTH, how God struck me down, not physically, but economically, to bring me to Him. That very depression of 1920 destroyed my business in which I was making the equivalent of $35,000 a year in today's money. Everything I touched turned, not to gold, like King Midas, but to loss of and lack of money. It was in poverty and hunger that God actually conquered me, and turned me to HIM, giving my life to HIM, more than 40 years ago. But even after conversion — even after my ordination as a minister of Jesus Christ in 1931 — our family was still on the economic rocks. I had begun to learn something about God's law of tithing as a Bible doctrine. I had studied it in the Bible. I had learned — seen PROVED — that this law was still in effect. Yet, in those early years, it didn't seem to apply to me. I had seen it as a doctrine to accept as true — not as a LAW that I, personally, must OBEY. How many of you are right now like I was then? For a few months I had been receiving a salary of $20 per week as a minister, holding evangelistic campaigns. We had been able to live, very modestly, on that. But at the end of November that year, the salary was cut off. The Church conference treasury was empty! I had learned the lesson of FAITH. I trusted God implicitly to supply every need, as He has promised (Phil. 4:19). But I didn't yet realize how much we must "TRY the spirits whether they are of God" (I John 4:1). So when a former newspaper associate came to me with an urgent request that I join him, as advertising manager of a new morning newspaper he was starting, I assumed, foolishly and without making sure this offer was caused by GOD, that it was the answer to my petition to supply our financial need. I had not yet learned, as I was to learn later, how to launch out in God's Work on faith, knowing that God had called me. Of course, many try to launch themselves into God's ministry when GOD NEVER CALLED THEM. They are making a bigger mistake than I made in turning back to the advertising profession. In my case God had called me from the advertising profession into His WORK. He had ordained me, put me into His ministry. I had "put my hand to the plow," but did not realize Jesus' command never to turn back. Of course I did not turn back from the Christian life — nor, for that matter, even consider for a minute that I was turning back from the ministry. I regarded this as only a temporary job. I thought God had sent it, to supply this need temporarily. I actually accepted the job on the condition that it was to last three weeks only, fully expecting the way would open to be back in the ministry within three weeks. But, once on this newspaper job, there was no quitting. God did not open the way to get back into His ministry until a year and three months had passed during which time I had realized my mistake and prayed earnestly to be released from the newspaper job and restored to God's Work. God let me learn the lesson, by experience, that His instruction to ministers, "Preach the word; be instant in season, out of season," meant "KEEP AT IT in season, and out of season." Once on this newspaper job, December, 1931 — in the midst of the Great Depression — there was no money to pay salaries. I had to work out a way of trading advertising for food, clothing, hotel and rooming-house accommodations for the 23 men on the staff. We had frequently gone hungry before I was converted. Now we went hungry even more frequently. Then one day, it dawned on my mind that we, ourselves, were actually breaking God's financial law by not tithing! All of a sudden God made me see His financial law as something personal — not merely a doctrine to accept impersonally. It meant ME! That very day I took 10% of what we had — and it was not enough to buy food — added an offering and mailed it to the Church treasury. That very afternoon food came for a completely adequate meal. I don't remember how, but I do remember that the very day I REPENTED for not having accepted tithing as a personal obligation, instead of a mere doctrinal argument, THAT VERY DAY FOOD CAME! God did not bring us immediate financial prosperity. For some years more, for our own good, we were forced to live in very poor economic circumstances. But that very day our financial condition started upward. Since that time I have known of the experiences of scores of other people. It was only a short time after that experience that God opened the way to bring me back into His active ministry. By this time I had learned that lesson, too. I have never left God's service, and never shall, as long as God permits me to live. It was some months later that the very man whom God sent with his truck to move us, together with what household furniture we had, back to the Willamette Valley in Oregon — where I was to start an evangelistic campaign in Salem — himself had an experience in tithing. This young man already was tithing the money that he handled. He was a farmer, and suddenly realized that he was not selling his eggs, and had not been tithing them in any way. He brought us a tithe of all the eggs his hens had laid that day. Believe it or not, that same day his hens went on an egg-laying spree. Yes, laugh if you will — those hens cackled, too — it actually happened. It was the off-season for eggs. But that very day they began to lay more eggs than was normal in the best egg-laying season! It seemed incredible — BUT IT HAPPENED! I have given you the facts, before, of the well-driller who was unable to get any business in 1933. He began to tithe — one single dollar of the only $10 he had. Next day a man who had owed him $50 he never expected to collect came and paid it — and he tithed $5. Immediately he began to get more wells to drill than he could handle. Almost daily, some radio listener, reader of The Good News or co-worker in this great Work writes me a letter telling of a similar experience — beginning to pay God's honest TITHE, and beginning to PROSPER financially. Now don't get the idea from this that in every case God is going to work some incredible miracle. Don't get the idea that if you TRY tithing, you are to expect some astounding thing to happen, or that you are going to fall heir to a million dollars the next day. Perhaps in most cases the increase in income is not immediately apparent at all. But of this, you MAY BE SURE! Over the long haul, the 90% of income God allows you to keep for yourself will increase to more than the 100% formerly was. God PROMISES to bless and prosper the tither! God KEEPS His promises! God did not establish a binding LAW of tithing without a good REASON! Actually, there are many reasons. All of God's LAWS are for our GOOD. Listen to God's Word to us: "Observe and hear all these words which I command thee, that it may go well with thee, and with thy children after thee for ever" (Deut. 12:28). It is not good for a person to get something for nothing, or for very little effort. This evil human urge to GET without giving — to receive without paying — is the very thing in human nature that produces criminals. ALL God's spiritual LAW may be summed up in one word — LOVE. But Jesus magnified this into the two great laws — love to God and love to human NEIGHBOR. Love is the principle of GIVING. Jesus summed up the reason for it when He said, "It is more blessed to GIVE than to RECEIVE". God knows and reveals that we receive a greater blessing by giving than by acquiring. God WANTS US TO HAVE BLESSINGS! People really want blessings, but few know the way. Most people think the greater blessing comes from receiving — getting — taking — acquiring. Today we talk about "the American WAY." But the WAY of most Americans today is to try to get more than they give. Formerly employers took more in production from labor than they paid employees in wages. So labor organized. Today the labor-union principle seems to be to get more, in wages, than they give in production from their labor. Less work — more pay! Deluded labor unions seem to think this is for their good. They don't know God's LAW. They know not that they are bringing a CURSE on themselves. We talk, today, about owning property. But God actually owns all the earth. That includes the property on which you pay taxes. God says the EARTH is His — for He created it! God OWNS it. He lets us occupy His earth, as temporary tenants. All wealth comes from the ground. IT IS NOT GOOD FOR MAN TO TAKE ALL HE CONSUMES OUT OF GOD'S EARTH WITHOUT PAYING ANYTHING FOR IT! If you rent ground from a MAN who thinks he owns it, he charges you rent — up to 50% or more of what you produce from it. God set a LAW in motion — that we should pay HIM, not 50%, but only 10%, plus whatever offering we have in our hearts to give. Now a LAW is not a law without a penalty. God does not force you to tithe. But if you don't, there is a penalty! You lose the BLESSING that goes with honest stewardship. You come under a CURSE! God says our WHOLE NATION is under a CURSE today (Mal. 3:9) because we have robbed God. The man who does not pay God His tithe is a thief — and, worse than a criminal robbing a bank, he is robbing GOD! Yes, God SAYS SO — Malachi 3:8! And one of the Ten Commandments is "Thou shalt not steal". The man who does puts himself immediately under the law — under penalty of DEATH for all eternity — unless he repents, and pleads the blood of Christ for forgiveness, and reconciliation to God! Ignorance of the LAW does not excuse. You may say, "Well, I never knew all this." Well, you are without excuse, for you know it now — or you can know it if you'll check up IN YOUR OWN BIBLE! But God is most merciful. The minute you really repent, quit breaking this law, begin keeping it honestly and go to Christ for forgiveness, then all is forgiven and God begins pouring out His blessing, just as He did on me. Hundreds of our Co-Workers have written me, during the past many years, saying God had opened their eyes to His tithing law, and telling how they have been blessed. One even wrote that she, too, had started tithing eggs, and her hens, too, had immediately gone on an egg-laying spree! She had either heard me mention that experience over the air or read of it in a former issue. Of course I won't guarantee God will cause hens to start laying eggs faster every time. Probably it won't work out exactly that way — but He does promise a blessing (Mal. 3:10-12). How do you pay your tithes to God? By putting them into God's WORK — where God Himself is working — where His Gospel is being preached, not merely MAN'S gospel about Christ, but the very message Christ preached. Most professing Christians have never heard the Gospel today! Jesus preached only one Gospel — that about the KINGDOM (government — rule) of God — of how God is going to RULE ALL NATIONS — of how we may, by being begotten now, be actually BORN INTO GOD'S KINGDOM at the Second Coming of Christ and the resurrection of the dead in Christ, being then GLORIFIED just as Christ is now glorified in the very FAMILY of God! But most professing ministers of Christianity today deny this Gospel altogether and say it is not for this time! WHAT does God do with His tithe? He uses it for HIS MINISTRY, to preach HIS message of REPENTANCE, FAITH IN CHRIST AND BEING BAPTIZED BY HIS SPIRIT INTO HIS FAMILY — His message of the KINGDOM OF GOD — the WORLD TOMORROW! It is the message of God's WAY. It is the message of true salvation. It is the message of a changed and a fuller, happier LIFE — the message of ETERNAL life, God's gift through grace! He uses it to tell mankind THE WAY to happiness, joy, prosperity and eternal life in HIS KINGDOM. But look at the CURSE! God's WAY has not been preached. The WORLD is unhappy, empty, sick, poverty-stricken, cursed with fears and worries, restlessness, frustrations, insanity, crime, violence, war — DEATH! Even though the NATION is under a curse, you, as an individual, may come under God's BLESSING! It's your BEST assurance of getting and holding a job — of continuous and increasing INCOME!